We’d love your help. 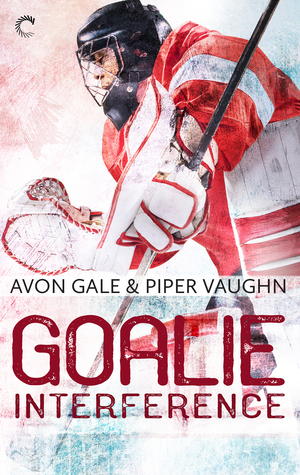 Let us know what’s wrong with this preview of Goalie Interference by Avon Gale. Ryu Mori has had a stellar season as goalie for the Atlanta Venom. So when he’s called into management’s office, he’s expecting to hear he’s the new starting goalie for the team, not that some new guy—an incredibly hot, annoyingly bratty rookie—is here to compete for his spot. Not everyone gets to play in the best league in the world. Emmitt Armstrong knows that, and he’s not about to waste the opportunity after grinding his way from the bottom to the top. If the Venom is looking for a meek, mild-mannered pushover, they’ve got the wrong guy. Ryu doesn’t want to admit the other goalie’s smart mouth turns him on. Beating Armstrong at practice feels good, sure, but there are other, more fun ways to shut his rival up. In this league, it’s winner takes all. But there’s more to life than winning, and if Emmitt and Ryu can get past their egos and competitive natures, they might just discover they work better as partners than they ever imagined possible. To ask other readers questions about Goalie Interference, please sign up. Avon Gale was once the mayor on Foursquare of Jazzercise and Lollicup, which should tell you all you need to know about her as a person. She likes road trips, rock concerts, drinking Kentucky bourbon and yelling at hockey. She’s a displaced southerner living in a liberal midwestern college town, and she never gets tired of people and their stories -- either real or the ones she makes up in her hea Avon Gale was once the mayor on Foursquare of Jazzercise and Lollicup, which should tell you all you need to know about her as a person. She likes road trips, rock concerts, drinking Kentucky bourbon and yelling at hockey. She’s a displaced southerner living in a liberal midwestern college town, and she never gets tired of people and their stories -- either real or the ones she makes up in her head.